If you want more repins on Pinterest, one thing you have to do is make sure your images are Pinterest perfect. I wrote this post on how to create images that get repins on Pinterest, and I briefly talked about the fonts you should be using in your title pins (images in your blog posts with your titles on to be pinned on Pinterest). One of the biggest mistakes people make when designing their pins is using bad fonts. I cringe sometimes when I see a title that’s in such a small script font it basically can’t be read. And you guessed it- if people can’t read it, they aren’t going to engage with it. No click throughs, no repins. I always advise to use a bold, easy to read font for your pins so the information is clear. However, I know that using a script font or more interesting font just adds a bit more personality to your pins. I actually like to use a nice script font here and there to give my pins a more feminine look. Here is a list of some beautiful Canva font pairings. I’ve tried to pick script fonts that are easy to read but still interesting, and paired them with a simple bold font. On the left hand side is the name of the Canva font for in the actual font, so you can see what it looks like and find it easily on Canva. On the right I have designed a pin using those fonts to show you how they would look on Pinterest. I’ve used the same layout, text and image for the pin image so you can just focus on the fonts! This above Canva font pairing is my favourite. I use it for most of my Pinterest Graphics, and it’s the one I have used for my blog logo! 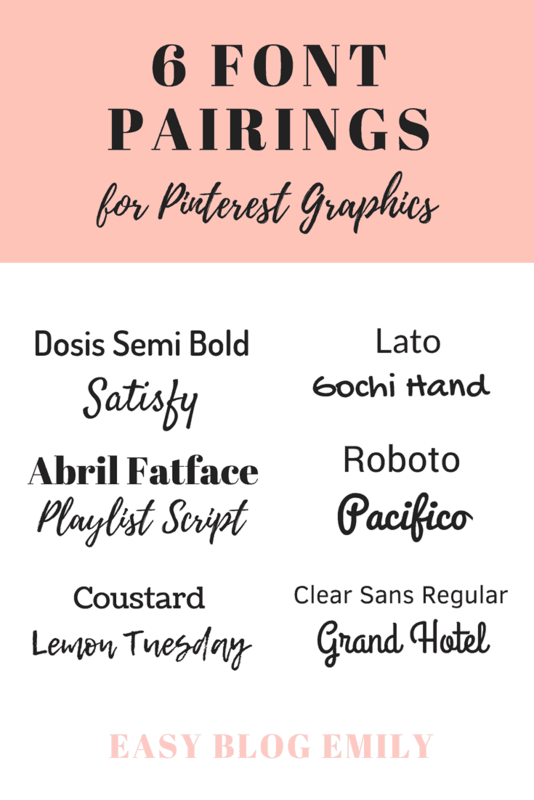 These are just some Canva font pairing suggestions. You can use them in whatever combination you want! Or even just use the bold ones alone. Even though script fonts are beautiful, legibility is really important on Pinterest. When your title is easy to read, it gets more re-pins. If you need more Pinterest tips, be sure to sign up for my free Pinterest course. 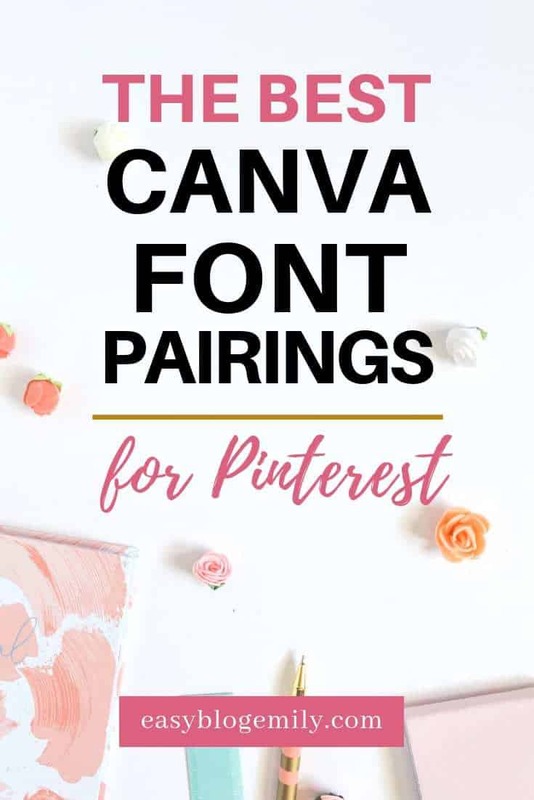 I hope this list has helped you find a Canva font pairing you love. If it has, please share it on Pinterest! And if you’re looking for even more help, make sure to check out this post on why you shouldn’t brand your pins and what makes an image stand out on Pinterest too. That way you’ll know you’re making the best Pinterest graphics you can!